Shoes of Peace, and Breastplate of Righteousness. What exactly is the Shield of Faith? It is our inner conviction that the Words of the Bible are true. That inner conviction keeps us believing the Bible no matter what. You are Lord of all. There is no place that you are not. There is no time that you were not. You are eternal, omnipresent, and all powerful. I will place all my faith in you and in your Word. 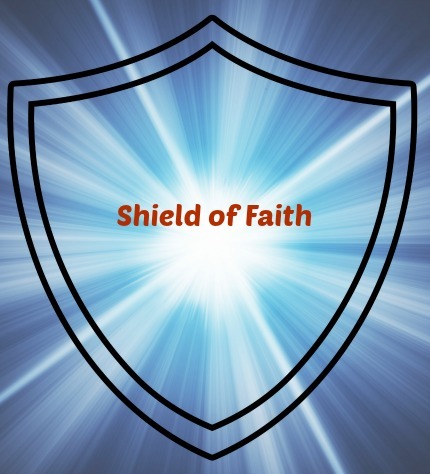 Shield of Faith is used to quench the fiery darts of the wicked one. Usually the darts are doubt darts. to doubt the Word of God. The more faith we have in God and God's Word, the less chance we have to be hurt by the fiery darts of the devil. When the doubt darts come, God teaches us to pick up our Shield of Faith and quench those doubt darts. A new Christian does not have a strong faith in the Bible. When trouble comes, he will waver. To strengthen our Shield of Faith we must read the Bible and verbally declare that we are dedicated to the truths of the Bible. And we must practice being obedient to God. 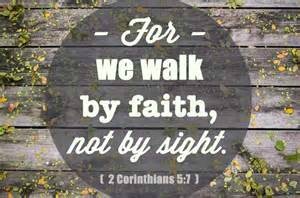 Our faith grows as our trust and our obedience to God grows. Faith is hearing what God says and doing it. that will help you grow your faith. Certain words will deepen our faith. our inner conviction of trust is deepened. God planned for us to use our mouth to help us create a stronger faith in Him. is by verbally putting on the full armor of God regularly. After I put it on, I feel stronger and more dedicated to God. I pretend that the pieces are visible and tangible. This habit has strengthened me and deepened my faith. Each time I put on the Full Armor of God, I say different words. I come before you to thank you for giving me your strong armor. I praise You for the power and authority you give me to use for your purposes. Today I put on the Helmet of Salvation. Thank you, Lord, for saving me from hell and providing a heavenly home for me. Lord, You designed my helmet to protect my thoughts. I will cooperate with You this day. I will allow godly thoughts to flow through my mind this day, and I will reject ungodly thoughts. Thank you for my Shoes of Peace. When I allow godly peace to guide me, I feel so good inside. I put on my Shoes of Peace. They cushion each step that I take. These shoes help to reduce the friction and irritation that can naturally come as I live in this ungodly world. Lord, I invite You to speak to me about any sin that I need to confess and ask forgiveness for. I want to feel totally comfortable with You. Thank you for your wholehearted forgiveness toward me. And thank you for this breastplate that covers my heart - which is the very inner part of me. Wearing this breastplate reminds me that You want me to guard my heart. You want my heart to be tender and protected from impurity. I will make decisions that will protect my heart from sinful things. Today I renew my dedication to Your truth. I will live within the boundaries of Your truth. I want to follow you more closely each day. I will tighten my belt so that I can feel it restraining me and protecting me from sin. I pick up my Shield of Faith. I will recognize doubt darts, and I will quickly respond. I declare that every doubt dart that is fired at me will be met with faith and trust in You, Lord, and in Your Word. Thank You for the Sword of the Spirit. I pick up the Sword of the Spirit, and I give voice to the Word of God. I will become more and more comfortable speaking out Scriptures. I will remind myself that when I speak out Your Scriptures, Your power is unleashed. in my words and in my actions. Truth is what GOD says is Truth. no matter what I experience. I can depend on Your Word. I will rely on Your Word. I will lean on Your Word. Your Word teaches me what is right. Your Word teaches me how to follow You. Your Word does not move with the wind or change with public opinion. My Shield of Faith in Your Word is growing strong. My Shield of Faith will quench all the fiery doubt darts of the enemy of my soul. A standard will draw the right people to you and repel the wrong people from you. "Bad company ruins good morals." I declare that this is my shield of confidence in the King of Kings and Lord of Lords. My Shield of Faith chases doubt away. My Shield of Faith will remind me that God is big enough to handle all my problems. Strong faith in God makes me feel good inside. My faith in God will grow strong. God doesn't need my analysis of the situation. I pick up my shield of confidence that God will direct my steps this day. My Shield of Faith protects me from lies that would reduce my confidence in the Lord and diminish my effectiveness for Him. I realize that I am going to have to think God's thoughts in order to achieve God's goals. I will invest in God's kingdom this day with deposits of kind words. I will invest in God's kingdom this day with deposits of gentle actions when I need to be gentle and firm actions when I need to be firm. Today my spiritual enemies will be the victims of the Word of God and the power of God.